HomeSituated in the Marina of Arbus, the Quinto Moro is a welcoming B&B open year round with a focus on active vacations in Sardinia. B&BThe Quinto Moro is set in the small village of Arbus, right next door to the splendid beach of Costa Verde, in South-western Sardinia. Costa VerdeThe Costa Verde lies on the south-western side of the island. It includes 50 km of unspoilt beaches and a fascinating mining heritage. Things to doThe Quinto Moro organises excursions and tours and offers covered parking areas for motor bikes and bicycles. Now it’s up to you to discover a different Sardinia! ExcursionsThe excursions organised by Quinto Moro will lead you to the discovery of the history, myths and unspoilt beauty of this enchanted corner of the island. The territory of ArbusThe B&B Il Quinto Moro organizes trekking and botanical trips in the surrounding countryside, helping guests discover the territory round Arbus. Trekking Monte ArcuentuDiscover the trekking routes organized by the B&B Il Quinto Moro of Arbus, experts in the territory and welcoming hosts. Trekking Monte LinasThe Quinto Moro organises a trekking tour on Monte Linas, to the discovery of the old abandoned mines and some jaw-dropping scenery. Muru Mannu, Piscina IrgasWe have designed for you a trekking route which starting from Monte Linas will lead you to the pristine countryside of Muru Mannu and Piscina Irgas. Waterfall Sa SpendulaQuinto Moro recommends a romantic visit to the waterfall in the evening hours. Just 20 minutes from our B&B – a true feast for the eyes. Giara of GesturiThe B&B Il Quinto Moro of Arbus organises visits to the Giara di Gesturi, an imposing upland plain and home to the wild Giara horses. ItinerariesThe Quinto Moro’s strategic position means easy visits to all the beauty spots of the Costa Verde – check here for more details. ArbusTheB&B Quinto Moro leads you to the discovery of Arbus, a mining town rich in history and curiosities – the gateway to authentic Sardinia. GuspiniGuspini at one time was one of the most important mining centres in Sardinia: discover the itinerary the Quinto Moro has set up for you. IngurtosuIngurtosu is one of the most interesting examples of a miners’ village in Sardinia – we propose itineraries and guided visits. MontevecchioQuinto Moro organizes guided visits to the Management Building and the Geo-Mining Park of Montevecchio. Castle of SanluriWe suggest a visit to the Castle of Sanluri, the only one still inhabited of the 88 castles built in Sardinia many centuries ago. Tomb of the GiantsLess than 5 minutes from the Quinto Moro, on the road from Arbus to Gonnosfanadiga, you will find the ‘Tomb of the Giants’ of S. Cosimo, a prehistoric megalithic communal grave. Caves of Su MannauThese caves contain amazing concretions, multi-coloured flowstone and traces of human presence from Nuraghic times. Discover more on Quinto Moro! Temple of AntasThe temple of Antas dates back to the Punic/Roman period. All around are other areas of historic and nature interest. Find out more. Barumini: Su NuraxiAn hour’s drive from the Quinto Moro will bring you to the Nuraghic village of Su Nuraxi, listed as a UNESCO World Heritage site. TharrosWe invite you to discover one of the most splendid Phoenician settlements in Sardinia. ActivitiesOpen year round, we organise tours and excursions along the Costa Verde and not only. Check on details and offers for your stay in Sardinia. Horseback excursionsThe “Quinto Moro" collaborates closely with the riding stables in the area and is able to organise for its guests horse trekking along the coast. Off-road excursionsFind out about the off-road excursions arranged by the Quinto Moro: check out details and offers on the website. Quad ExcursionsWe are here to help you in quad rental at Piscinas and the choice of the nature route which best meets your needs. Read on to discover more! Excursions donkey-backWe will be happy to organise and plan with you an itinerary and put you in contact with a very unusual riding centre. Tour ox-drawn cartA truly unique experience, appealing and amusing, to the discovery of one of the most authentic faces of Sardinia. Read on to discover more! Preparation myrtleThe Quinto Moro organizes the harvesting of myrtle berries and courses for the preparation of this exceptional Sardinian liqueur. Mushroom-pickingIn autumn Sardinia takes on a peculiar fascination – discover its beauty guided by the Quinto Moro which organizes outdoor trips and excursions. Boat excursionsWe organise boat rental and excursions, deep sea long-line fishing and water skiing – read on to discover details! Diving and snorkellingThe South-western coast of Sardinia is off the beaten track and is thus able to offer splendid, unrepeatable experiences for visitors who truly love the sea. Air TourWe offer our guests an exciting alternative to explore southern Sardinia – an aerial view! Mountain BikeIn collaboration with mountain biking tour organisers, the Quinto Moro suggests cycling excursions to some of the most attractive venues on the Costa Verde. Motorbike tourismThe Quinto Moro offers guests covered, attended parking for motor bikes and organizes trips along scenic winding roads on the Costa Verde. BeachesFrom our B&B you will reach in a very short time all the beaches along the coast: Piscinas, Torre dei Corsari and Scivu. Costa Verde, Portu MagaDriving along a scenic road linking Marina di Arbus to Piscinas, you will reach the true Costa Verde. Find out more! Piscinas DunesThis is the most stunning beach on the Arbus coast, with sand dunes reaching 100 m – check the photo gallery and find out how to get there. The beach of ScivuOften used as a setting for TV commercials, Scivu has its very own special untamed appeal – crystal-clear seas and fine white sand. Marina di ArbusJust 30 minutes from the B&B you will find the beach of Marina di Arbus, with crystal-clear water, a comfortable, easy to reach beach for older beachgoers. Funtanazza BeachA 1-km long beach of fine golden sand, sheltered by a pine wood. A natural pool makes it an ideal spot for the kids. Porto Palma - TunariaTunaria - Porto Palma is a small fishermen’s village under the protection of Sardinia’s Art Heritage Department. 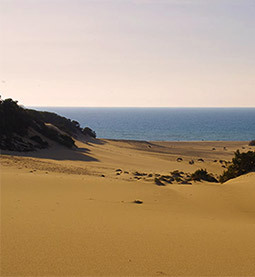 Torre dei CorsariThe beach of Torre dei Corsari is a rare sight – tall dunes and a breath-taking view. Just flick through the photos and discover all the beaches of the coast. The beach of PistisThe beach of Pistis consists of a sand dune more than 2 km long which to the south joins up with the beach of Torre dei Corsari. Capo PecoraIdeal for snorkelling and diving, situated in the municipality of Arbus. Click through the photos and discover one of the most beautiful beaches of the cost. Cala DomesticaCala Domestica and the nearby bay of Portu Casu are both ideal sheltered spots during days with high winds and heavy seas. Check here to see how to reach them. Masua, Pan di ZuccheroMasua’s waters host a unique natural monument the "scoglio di Pan di Zucchero" (Sugar Loaf rock). MarceddìAn ancient fishing village, home to the best fishmongers’ stalls and fish restaurants along the coast – follow our recommendations. GalleryAre you still undecided where to take your holiday? Leaf through our Photo Gallery and make your dreams come true: Quinto Moro B&B: sea, activities and food & wine! Food & WineDiscover Sardinia’s food and wine traditions and the best restaurants to savour the island’s old traditional recipes.